We offer the most fun, fastest and best stocked boats in Coeur d'Alene. Get a day on the lake you will remember for years to come with our fully outfitted Cobalt ski boats. 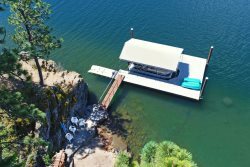 Loaded with water toys and designed for high performance, these are truly the best rental boats on Coeur d'Alene. Over 22 feet long for a spacious cabin and excellent handling on our big Idaho lakes. Smaller boats are just not fun on our big water.